Find out what are these best practices and listen to what our users say about their experience with Aras. Eleven months into its PLM implementation, Boeing Insitu business found itself almost a year behind schedule and severely over budget. In this webcast you'll hear first-hand how they regrouped and made PLM a success - in less than 60 days. Watch the video to learn how Lear met their unique business needs for global change management, while remaining intuitive for end users. Discover the benefits of true Multi-CAD PLM integration for product and process. It's full CAD IP management with automated part BOM updates and enterprise change management - across all your favorite authoring tools. Aras Component Engineering makes it easy for users to select and source the electronic components that best meet their requirements for performance, price, compliance, availability and lowest risk. Watch the demo to see it in action. Learn valuable information on preparing your server, setting up your client, and connecting to Aras. Join Aras's Lisa Costa as she walks you through a demonstration of PDM designed to handle today's complex product and processes. Learn how easy it is to use Aras Innovator PLM with connectors to CAD and other authoring tools such as MS Office. Aras Chief Architect Rob McAveney he walks you through a demonstration of Aras Innovator's Basic Customization capabilities. Discover how the Aras Office Connector can bring order to your documentation process. Vice President of Product Management John Sperling shows you the Aras Office Connector in action. Watch as Aras Chief Architect Rob McAveney walks through the advanced features of Aras Change Management, including change workflows, dynamic task assignment and impact analysis with the Impact Matrix. Get the highlights on Aras Innovator in this short, 10 minute Product Overview Demonstration. 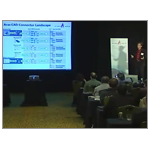 Discover the Aras difference in this brief, 3 minute presentation. Learn about the powerful capabilities of Aras Innovator in this 18 minute demonstration. CAPA processes address internal corrective actions, as well as, Customer Corrective Actions and Supplier Corrective Action Requests (SCAR). Follow this step-by-step demonstration to learn exactly what to do using the Aras import/export tool, and take advantage of all the awesome Community Solutions for Aras. What do you do when your boss tells management you'll have that new PLM system rolled out in 60 days? If you're the Boeing-Insitu team, you rise to the challenge. Pam Schwandtner of Boeing-Insitu provides tips to make your PLM initiative just as successful as their 60-Day PLM Implementation Challenge. Before PLM, Case New Holland was managing by spreadsheet. They had no visibility of their process steps for new product launches, no data integrity, and no accountability. See how Implementing Aras PLM allowed them to fill their management voids. Rob McAveney, Director of Product Management, takes you through the workflow of a simple ECO in this short video. Learn how Boeing Insitu went from zero to over 60% Fast Track Releases using Aras's out of the box CMII Change solution. Aras Director of Product Management Rob McAveney gives you a quick look at the Configuration & Change Management process, showing you a uniform way of managing changes that impact the business at the enterprise level. Discover Innovator is a feature-rich, high performance search application that allows Aras Innovator users to quickly find Parts, Documents and other Aras Innovator items using a powerful, industry proven search engine. See what end users from across Dedicated Computing have to say about Aras, and find out what's next for the innovative company. Find out how General Electric customized Aras PLM to produce “big wins” across the board for their engineering teams. See how a leading high tech electronics company chose Aras and learn more about their PLM story. Learn how the Creo CAD Connector for Aras increases productivity across the product lifecycle, while reducing data management time, and eliminating data entry errors and duplication. Reduce training and increasing user acceptance with a common platform spanning MCAD, ECAD, and ERP systems, allowing designers to continue working within their familiar environment. Learn how the ITI TranscenData NX CAD Connector for Aras enables you to fully leverage your investment in NX by unlocking valuable CAD data for the enterprise and extended enterprise with secure access and permissions, while allowing designers to continue working in their familiar NX environment. Get a full tour of Aras Innovator and learn how we can meet your complex product and process management needs. MAN Diesel & Turbo expands their existing Teamcenter implementation with Aras Innovator to build an agile system landscape for their company. See how Motorola is using Aras Program Management to improve time to market, reduce costs, enhance visibility, and to help manage the new reality of life under Budget Sequestration. The MultiCAD Gateway from Elysium automates the conversion of CAD data to other native CAD formats, including NX, Creo, SolidWorks and others, providing companies that run Aras with embedded functionality for CAD model interchange, translation, validation, geometry comparison, data optimization and more. Discover how in less than 5 months, Nidec Motor Corporation, a PDM/PLM veteran, was able to migrate 215,000 TC item masters representing 290,000 total item revisions and 320,000 files. And they did it with zero - yes, zero - differences. Learn how Aras provided Saab a scalable PLM environment that could be easily customized and integrated globally to better support product information across the entire lifecycle with a focus on serviceability. Simple and CMII-based Change. Which One is Right for You? The two most common types of change management are simple and CMII. Watch as Rob McAveney, Aras Director of Product Management, spells out the differences for you in this short video, then decide. Learn how the SofTech AutoCAD Connector for Aras enables you to fully leverage your investment in Autodesk by unlocking valuable CAD data for the enterprise and extended enterprise with secure access and permissions, while allowing designers to continue working in their familiar Autodesk environment. Learn how the SolidWorks Connector for Aras enables you to fully leverage your investment in SolidWorks by unlocking valuable CAD data for the enterprise and extended enterprise with secure access and permissions, while allowing designers to continue working in their familiar SolidWorks environment. Learn how GETRAG Ford creates a custom tool for developer documentation with Aras to analyze the structure of their applications. Get a glimpse into the future of manufacturing and the many ways technology will drive innovation and global collaboration. Built on top of SolidWorks Enterprise PDM, Aras EPLM is a full-featured, business-ready solution for Product Lifecycle Management that drives cross-functional collaboration and extends engineering business processes throughout the company and the extended supply chain. With the launch of Aras Innovator 11, Aras introduces visual collaboration providing the fastest, simplest way to collaborate securely across disciplines, locations and organizations. Watch this on-demand webcast to get an introduction to visual collaboration and see Aras Innovator 11 in action. If you use DOORS, SLATE or MKS Integrity, join us to learn how Aras Requirements Management can help you take your requirements management to the next level. Aras Requirements Management is a next generation requirements management solution embedded in enterprise PLM for systems engineering. Discover what sets Aras apart of from traditional PLM / PDM products and find out about our vision & roadmap and what we’re doing today to help you transform your business, standardize global processes and prepare for a dynamic future. Hot off the stage from ACE 2013, we invite you to join us for The Aras Innovator Update webcast. Aras’s Rob McAveney walks you through all the latest Aras releases and lays out the upcoming Roadmap showing you all the ways Aras is helping you DO MORE. Join us to see Aras VPLM in action. Learn how Aras VPLM can extend your Autodesk Vault implementation to drive PLM processes throughout your company and supply chain, for collaboration across organizations including product development, operations, quality, purchasing, sales and marketing and other groups worldwide. As global product development processes become increasingly complex, you've got to manage a very sophisticated change management process across electro-mechanical assemblies, product information and system configurations. And you need to be able to quickly and continuously customize your change process to keep pace and maintain your competitive advantage. Delivering on the promise of innovation through best-in-class product development in today's environment requires truly rethinking products and processes. Learn new strategies to improve product development processes, reduce costs and get better products to market faster. Our latest open release is a broad series of new innovations that include numerous corporate community contributions. Join us for this informative Webcast and learn about the newest capabilities and latest enhancements to Aras Innovator, and find out why Aras is the future of PLM software. As the pace of global product development increases, you've got to manage ever greater change complexity. Fortunately, Aras has a series of change management options available right out of the box. From a simple ECO process that's ready-to-use to full CMII compliant PR/ECR/ECN workflows with sophisticated impact analysis. The Office connector for Aras EPLM extends the benefits of enterprise PLM to SolidWorks users in Microsoft Excel, Word, PowerPoint and Outlook. Users can create, store, edit, search and manage documents while working within the familiar, easy to use Microsoft environment. The Microsoft® Office Connector for Aras Innovator® enables global organizations to manage documents, spreadsheets and emails in the Aras PLM suite without leaving Microsoft Office applications. The Office connector for Aras improves personal productivity while driving standardization and consistency for compliance throughout the enterprise. It's no secret that despite good intentions, best efforts and lots of hard work, most multi-CAD file management systems don’t deliver. In this Webcast, we dig into the leading causes of failure, and offer practical solutions for achieving multi-CAD success. Strategy matters and goals count. Learn how to create a PLM strategy with a clear vision and defined goals that leads to improved innovation, better time to market and greater corporate profitability. The global recession and slow pace of recovery have created a "new normal" that has changed PLM forever. Big Bang, All-At-Once is out. Smart, Flexible and Responsive is in. Learn how to transform your organization's approach to PLM to anticipate changing needs, leverage the latest technologies and thrive in a dynamic global market. Join us to see Aras EPLM in action. Learn about the newest features & functionality and how it can help global companies like yours leverage your investment in SolidWorks to improve product quality, accelerate time to market and achieve greater profitability.